The second wave of bands and breweries for Decibel Metal & Beer Fest: Los Angeles, set for December 1 and 2 at the Wiltern, welcomes American melodic death metal kingpins THE BLACK DAHLIA MURDER (Metal Blade), doom 'n' rollers KHEMMIS (20 Buck Spin) and craft beer-obsessed extreme metal veterans TRAPPIST (Relapse) to an already-stacked bill. Decibel Metal & Beer Fest veterans Three Weavers also join the breweries attending. And there's still a final round of bands and breweries to be revealed in August! "We are super excited to be working with our friends from Decibel on this year's Metal & Beer Fest," says Brian Slagel, CEO of Metal Blade Records, the festival's presenting sponsor. "It will be a great time and we are honored to again be working with everyone at Decibel magazine." Headliners include thrash legends TESTAMENT, who will play a special set of both their classic The New Order and The Gathering records in full, along with the Tom Gabriel Fischer-led TRIPTYKON performing a special all-CELTIC FROST set. Grind heroes PIG DESTROYER, revered doom trio YOB, new thrash gods POWER TRIP, death metal upstarts SKELETAL REMAINS, Bay Area bruisers NECROT and heavy metal new jacks HAUNT round out the band lineup. "I'm sure we'll see fans travel from all corners of the planet to witness this heavily overdue set!" exclaims TESTAMENT guitarist Eric Peterson. "Get your tickets quick! You won't wanna miss this event. A gathering of the new order is upon us!" 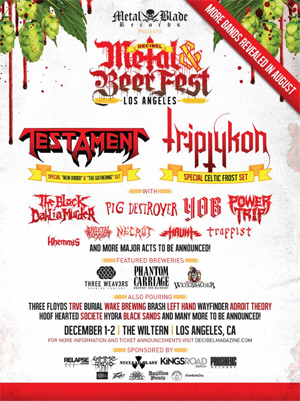 Not to be outdone, the country's most metal breweries will converge in a maelstrom of malt madness! Featured breweries Phantom Carriage (CA), Three Weavers (CA) and Weyerbacher (PA) will be joined by flagship breweries Three Floyds (IN), TRVE (CO), Brash (TX), Adroit Theory (VA), Burial (NC), Hoof Hearted (OH), Societe (CA), Left Hand Brewing (CO) Hydra Brewing (SD) and Wayfinder (OR), while Wake (IL) and Black Sands (CA) will make their first Decibel Metal & Beer Fest pours. And just like when the musicians in the night's best bands hang out before and after their sets, the metalheads that make these skull-crushing high-gravity beers will be headbanging along during the festivities, ready to toast exclusive samples and, of course, talk metal and beer.
? Special discounted early-bird weekend "Metal & Beer" tickets, entitling attendees to pours from each of the attending breweries all weekend long, are on sale. Visit decibelmagazine.com for tickets and more information.